The Vancouver author on writing her debut book, which is on the shortlist for the $50K Rogers Writers' Trust Fiction Prize. Jen Neale's debut novel, Land Mammals and Sea Creatures, is among the five finalists vying for the 2018 Rogers Writers' Trust Fiction Prize, an annual $50,000 award recognizing the best in Canadian fiction. The book features elements of magic realism and themes of environmental protection, family, and life and death; it's about a young woman named Julie struggling with her PTSD-afflicted war vet father while a series of animal deaths that look suspiciously like suicides occur in her small West Coast seaside town. 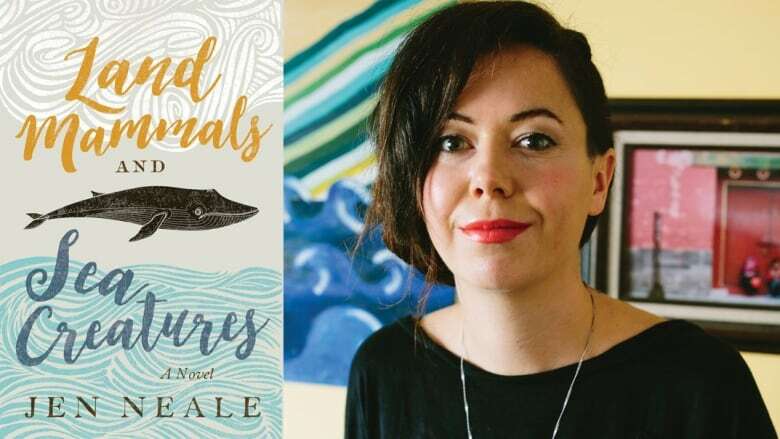 The Vancouver-based novelist and short story writer — who won the 2012 Bronwen Wallace Award for emerging writers— tells CBC Books how she wrote Land Mammals and Sea Creatures. "I wrote the novel for my MFA thesis at the University of British Columbia. I had to write a novel within a certain timeframe. The first idea that randomly came to me was about the environment — what if it got so bad that the animals didn't want to live anymore? Then it was about coming up with characters that would go around this scenario." "I've written a lot of short stories with magical and fabulous elements to them. Fantastical elements are much easier to sustain in a short story because you can just stay completely in that imaginary space. I did find it a challenge for the novel in trying to maintain both the realistic storyline of the characters and then this magical element with the animals. "I think they worked out, in a parallel fashion, in the end. They didn't necessarily directly inform each other, but they both had their own track within the story." "For the first draft of this novel, I did a writing challenge with two of my friends. We had to write four pages every single day and submit them to each other to confirm that we done it. That's not something I would necessarily do again — but I ended up with a lot of pages I was able to be whittle down for this book. "I wasn't planning to do heavy research, as I was dealing with the imaginary realm. But when I decided that I was going to have a Gulf War veteran as one of the main characters, I definitely needed to do more research. I didn't have any personal experience with Gulf War vets, so I spent some time on forums and chatting with people and finding out their experiences." "Worldbuilding is the thing that I struggle with the most when I'm writing. I find it a lot easier to lay on the couch and close my eyes and try to picture how everything looks. Character building, for me, is about slowly trying to come up with specific traits or details and then trying to work them into the person. "I tend to be more on the planning side of things when writing versus being a [seat of my] pantser. I like knowing the points that I want to hit along the way." Jen Neale's comments have been edited for length and clarity.